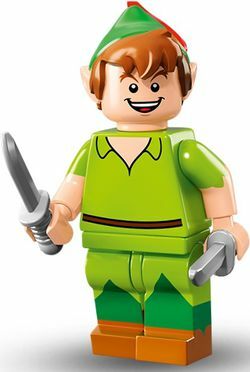 Peter Pan is a Jake and the Never Land Pirates DUPLO figure released in 2014 who later appeared as a minifigure in 2016. This is a description taken from LEGO.com. Please do not modify it. A mischievous and magical boy who never grows up, Peter Pan lives on the far-away island of Neverland, where he has adventures every day leading the Lost Boys and battling a gang of villainous pirates led by Captain Hook. With the help of his fairy friend Tinker Bell’s golden pixie dust, Peter can even take to the air and fly – but he must be careful not to lose his shadow! A mischievous and magical boy who never grows up, Peter Pan lives on the far-away island of Neverland, where he has adventures every day leading the Lost Boys and battling a gang of villainous pirates led by Captain Hook. With the help of his fairy friend Tinker Bell’s golden pixie dust, Peter can even take to the air and fly – but he must be careful not to lose his shadow! This page was last edited on 13 July 2016, at 01:47.